Forbidden romances. Dystopian worlds. Unimaginable creatures. Dark nightmares. Beautiful dreams. All within the Realms of an Open Mind. What do the Greek gods do when they're bored? Because they're always bored, so humans are the perfect players in their games. Aphrodite owns love; she hasn't lost a competition on her turf in over three millennia. Apollo is on a mission to win. He's counting on it to finally get the one woman he's never been able to have. The two gods will choose their human players, and if Aphrodite can't get them together before the clock runs out, Apollo will get his way. And Aphrodite couldn't have that. Lex and Dean are perfect for each other, they just don't know it yet. Dean is a perpetual bachelor, and a brooding, beautiful rock star. Lex is always with a man, but she'll never fully give herself up. Aphrodite has her work cut out for her, but if she can't make it work, no one can. The gods have their own drama. Apollo killed Aprhodite's mortal love - they've got beef that's been dragging on for thousands of years. Ares, the douchebag, is forever trying to pick a fight, and trying to get Aphrodite into bed. 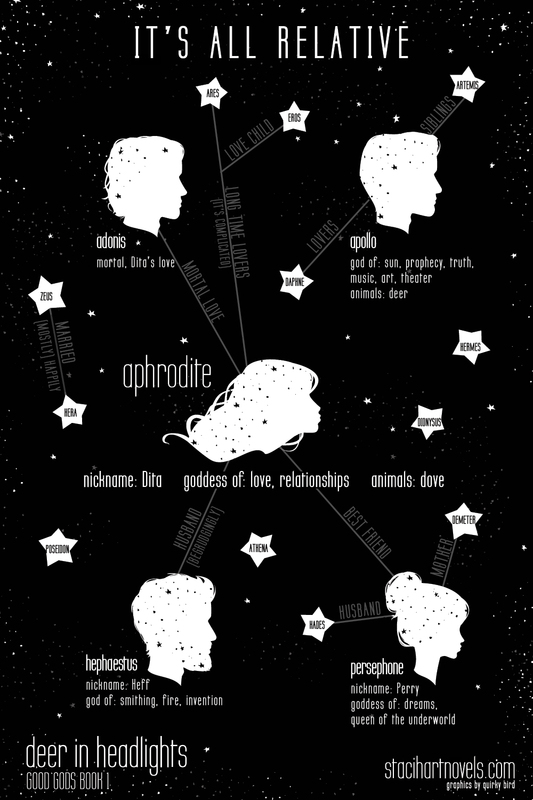 And Persephone, Aphrodite's best friend, is the one person who Aphrodite shares everything with. Follow the gods as they fight, laugh, cry, lose love, gain power, and make a mess with humans. 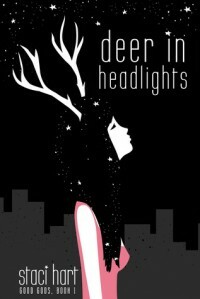 Deer in Headlights by Staci Hart is one of those novels you will read in a single afternoon. It's fast, fun, and emotional, and even at only 164 pages, this little book packs a pretty decent punch. Greek mythology plays a prominent role, but with a modern twist. The gods still meddle in the lives of mortals, but their lifestyle has advanced significantly from what we learned about them in college. The personalities of each god or goddess are dynamic and nothing like the cut and dry text book versions that I studied in my art history classes. Hart gathers these legends of ancient history and gives them real voices we can all relate to. And you think mortals have drama? Trying roaming through the world of the gods. These "people" have no competition when it comes to the shenanigans and pain they can conjure up against each other. Their relationships are strange, as all of them have some kind of history during which they tried to tear each other apart, but who can hold a grudge for centuries? They all forgive, but man, do they cause some damage when they're vengeful. Not to mention the little games they play with the hearts and fates of mortals. If you're a sucker for bad-boys, you'll fall right in love with Dean. He's slightly screwed up, but throw that in with a splash of gorgeous and a boatload of heart-melting writing skills, and you've got yourself a combo that's difficult to ignore. Lex is just as messed up as Dean, if not more so. He's got commitment issues, she's got abandonment issues. But each of them sees something in the other, something they can't resist, and the thick tension between them becomes a heady mix of desperation, fear, and hope. Their relationship was... I really don't know how to describe it in one word. They were infatuated from the moment they set eyes on each other. They hit it off after a few exchanges, and after that, they're both done for. There's no going back. At first, I wanted to say that it felt rushed because their relationship went from 0-90 in about 6.7 seconds without a whole lot of dialogue between them, but with the role the gods play, and the intensity of the moments Dean and Lex share, I couldn't help but believe it and root for them. The development of the characters was perfect, especially given the short span of the story. Main characters aside, the side characters really surprised me, and I found myself loving every single one of them. From the glimpses we get of the many gods lounging in Olympus to the spicy personality of Kara, Lex's best friend, to the laid-back demeanor of Travis, Lex's boyfriend (yup, that's right), I realized that I had completely fallen for them. As a character-driven reader, this is HUGE for me, and wanting to know and experience more of the characters, there's no way I'm not reading the next book. Staci Hart has a hilarious writing style, but she knows when to be serious. It's this mix that brings comic relief at the exact perfect moment in the midst of all the drama ~ there's a lot of craziness, pain, and emotion between the world of the gods and that of the mortals, but you never feel overwhelmed; you're laughing too much for that. *Love* the combination. Like I said, Deer in Headlights is a fast and extremely fun read. But although it's quick, there's so much packed into the pages, that you're not left wanting in the end.